This article is about the actor. For other uses, see William Best. William "Willie" Best (May 27, 1916 – February 27, 1962), sometimes known as Sleep n' Eat, was an American television and film actor. Best was one of the first African-American film actors and comedians to become well known. In the 21st century, his work, like that of Stepin Fetchit, is sometimes reviled because he was often called upon to play stereotypically lazy, illiterate, and/or simple-minded characters in films. Of the 124 films he appeared in, he received screen credit in at least 77, an unusual feat for an African-American bit player. A native of Sunflower, Mississippi, Best reached Hollywood as a chauffeur for a vacationing couple. He decided to stay in the region and began his performing career with a traveling show in southern California. He was regularly hired as a character actor in Hollywood films after a talent scout discovered him on stage. Willie Best appeared in more than one hundred films of the 1930s and 1940s. Although several sources state that for years he was billed only as "Sleep n' Eat", Best received credit under this moniker instead of his real name in only six movies: his first film as a bit player (Harold Lloyd's Feet First) and in Up Pops the Devil (1931), The Monster Walks (1932), Kentucky Kernels and West of the Pecos (both 1934), and Murder on a Honeymoon (1935). He thereafter usually received credit as "Willie Best" or "William Best". Best was first loved as a great clown, then later in the 20th century reviled and pitied, before being forgotten in the history of film. Hal Roach called him one of the greatest talents he had ever met. Comedian Bob Hope similarly acclaimed him as "the best actor I know", while the two were working together in 1940 on The Ghost Breakers. As a supporting actor, Best, like many black actors of his era, was regularly cast in domestic worker or service-oriented roles (though a few times he played the role echoing his previous occupation as a private chauffeur). He was often seen making a brief comic turn as a hotel, airline or train porter, as well as an elevator operator, custodian, butler, valet, waiter, deliveryman, and at least once as a launch pilot (in the 1939 movie Mr. Moto in Danger Island). Willie Best received screen credit most of the time, which was unusual for "bit players"; most in the 1930s and 1940s were not accorded due credit. This also happened to white actors in small roles, but black actors were not credited even when their roles were larger. In more than 80 of his movies, he was given a proper character name (as opposed to simple descriptions such as "room service waiter" or "shoe-shine boy"), beginning with his second film. Best died on February 27, 1962, at the Motion Picture Country Home in Woodland Hills, California, of cancer at age 45. He was buried (by the Motion Picture Fund) on March 5, 1962, at Valhalla Memorial Park Cemetery. Best's "Sleep n' Eat" moniker surfaced again in the 2000 motion picture satire Bamboozled, directed by Spike Lee. In the film a "twenty-first-century minstrel show" is televised starring two African American performers, one of whom (portrayed by Tommy Davidson) plays a character named "Sleep n' Eat". In a nod to one of Best's most respected contemporaries, his on-stage counterpart is named "Mantan". ^ Littleton, Darryl (2006). Black Comedians on Black Comedy: How African-Americans Taught Us to Laugh. Hal Leonard Corporation. p. 46. ISBN 9781557836809. Retrieved 5 August 2018. 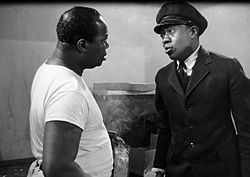 ^ "Willie Best - About This Person - Movies & TV - NYTimes.com". Retrieved 24 March 2016. ^ "Movie Review - The Smiling Ghost - Poor Ghost - NYTimes.com". Retrieved 24 March 2016. ^ "Movie Review – The Ghost Breakers – THE SCREEN; 'Ghost Breakers,' a Comic Thriller, at Paramount – Spy Pictures at the Rialto and Palace – NYTimes.com". Retrieved 24 March 2016. ^ "Willie Best". IMDb. Retrieved 24 March 2016. ^ a b c Terrace, Vincent (2011). Encyclopedia of Television Shows, 1925 through 2010 (2nd ed.). Jefferson, N.C.: McFarland & Company, Inc., Publishers. pp. 732–733. ISBN 978-0-7864-6477-7. Wikimedia Commons has media related to Willie Best.